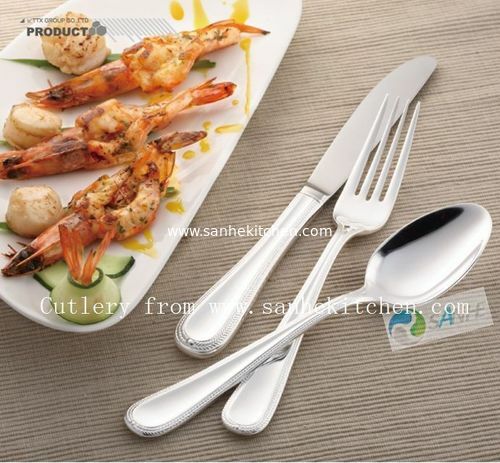 A good set of stainless steel cutlery, depending on steel model, process, polishing technology, which processes and polishing with the naked eye can see it, good stainless steel cutlery steel models can usually be marked surface of the tableware stone Tai Groupstainless steel cutlery steel models, introduced everyone to help you buy stainless steel cutlery in the understanding of these, I believe. Commonly used to make kitchen utensils, stainless steel can be broadly divided into 430(18-0),304 (18-8),18-10 three grades. 18-8 stainless steel: iron 18% chromium and 8% nickel, anti-chemical oxidation, but more and more the chemical composition of the air, some of which are more polluting with 304 rusty; Therefore, some senior supplies will be produced with 10% nickel, and in order to make it more durable to resist more, this stainless steel called 18-10 stainless steel. Argument similar to the "to 18-10 most advanced medical stainless steel" on the instructions of some cutlery. It is worth noting that the cheap market to sell all 201 material, but this material is not in the GB, because of its poor corrosion resistance, would not achieve the role of day-to-day kitchen antirust and contain heavy metals, long-term use of the body harmful, the the 201 steel cutlery most commonly used stainless steel chopsticks, stainless steel pots, with particular attention to in the purchase.